Monday, March 26: Another warm front arrived with record high temperatures over 26C this afternoon. Chorus Frogs are in full song throughout the area and Painted Turtles are basking on logs in the creek. By the evening there were Northern Leopard Frogs and American Toads singing. Also seen today were our first Green Frog and Blanding's Turtle. Mourning Cloak butterflies were first seen on March 24th. Migrant birds seen today around the centre included 20 Golden-crowned Kinglets, 3 Brown Creepers, 2 Northern Flickers and a Hermit Thrush (Mary Montsch). Tuesday, March 13: Bitter cold last Tuesday but +20C and sunny today. Migrant American Robins, Killdeers, Red-winged Blackbirds, Common Grackles, Song Sparrows, Eastern Phoebes and Turkey Vulture are present around the nature centre. 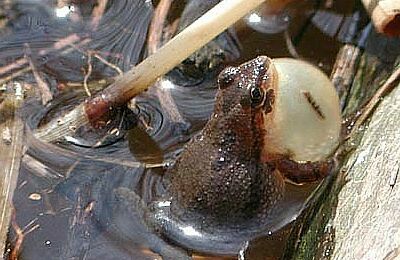 The first calling Chorus Frog and first Eastern Gartersnakes of the spring were also noted today. Russ Jones reported two Tree Swallows over Ojibway and many Chorus Frogs calling this afternoon at the large pond in Spring Garden Natural Area. American Woodcock were displaying in the evening at several sites. Wednesday, March 7: Despite the winter conditions there are many signs of spring. Canada Geese are flying in pairs, Mourning Doves and Cardinals are singing, adult male Red-winged Blackbirds are showing up at feeders and Ring-billed Gulls are back at the mall parking lots. Forty Common Grackles flew overhead yesterday evening and an American Robin was at seen at Ojibway this morning. Windsor forestry staff helped place an eagle nesting platform at Point Pelee last fall. An adult Bald Eagle was seen perched at the artificial nest site on the past weekend. Copyright © 2007. All rights reserved. You are on a City of Windsor Web Site.